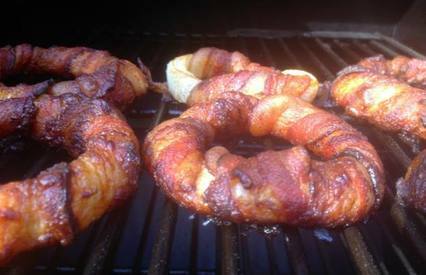 First came Bacon-wrapped prunes. Then jalapeño poppers, then Bacon-wrapped chicken wings. The latest manifestation of America’s Bacon mania is onions—thick rings of Vidalias or other sweet onions dipped in hot sauce, swaddled in hickory-smoked Bacon strips, and indirect grilled until the Bacon is as crisp as the onion is meltingly tender.